$25.95 (save $6.00). Once it sells, it's gone. We do not expect to restock. 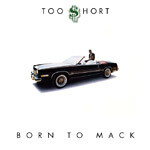 Born To Mack is the first full length album by Oakland native TOO SHORT, and his first major album release. Originally released on Dangerous Music in 1987, when it was a nationwide underground sensation. Featuring the classic track ''Freaky Tales,'' this is the album that launched Too Short to stardom. In 1998, the album was selected as one of The Source's 100 Best Rap Albums, and the song ''Freaky Tales'' reached # 92 on the 100 Greatest Rap Songs. Reissued on 180 gram vinyl.